Alex Kochte and her date, Michael Young, are perfectly matched in red and white. The satiny dresses and sleek tuxedoes. The curling irons and make-up. The limos, flashing cameras, and parents beaming with joy. 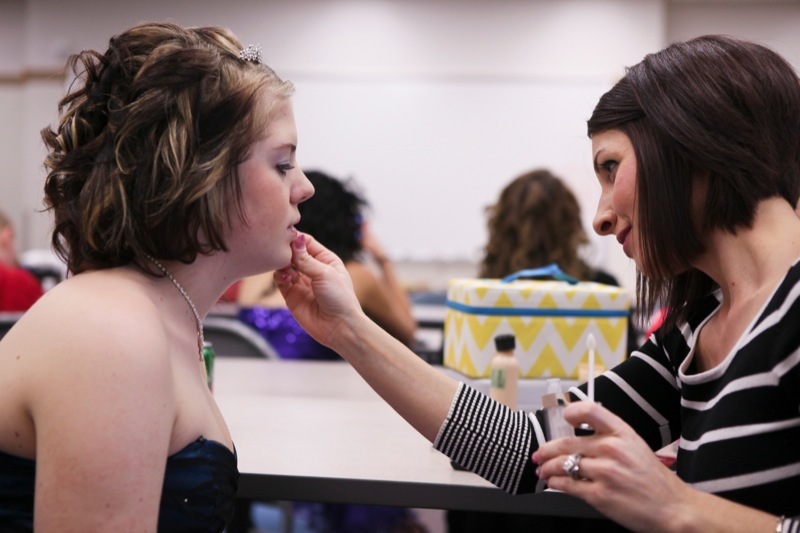 This was not a typical Friday afternoon in Akron Children’s Hospital’s Considine Professional Building, as staid conference rooms transformed into full-fledged “prom prep” centers with excitement as thick as the hairspray in the air. Everything from the dresses, the salon services and the limos were donated. For a few hours, it was all about the hair, nails, shoes, purses and lip color shades – as girls were getting ready for an unforgettable night of fun in downtown Cleveland at the Ritz Carlton. The guys, of course, had less prep work and, thus, more time to chat, check in with Facebook and munch on cookies. About 25 teens who have overcome cancer gathered with their dates, friends or siblings April 5 for departure to A Prom to Remember. This was the third year for the event, organized by Jane Knausz, who learned of the first chapter of A Prom to Remember in Ft. Lauderdale, Fla.
Knausz decided to create her own non-profit and organize a similar annual event in northeast Ohio for the patients of Akron Children’s Hospital, University Hospitals’ Rainbow Babies Children’s Hospital and the Cleveland Clinic’s Children’s Hospital. Teens with cancer often have to miss their own high school proms and other significant social events as a result of their treatment. They may feel self conscious about their hair and weight loss or having to walk with crutches. But, A Prom to Remember is a place where everyone can relate and just be themselves. Patient Lexie Hodges, dazzling in a short blue dress with sequins, posed for pictures with her friend, Alycia Wagner. Lexie was excited to be attending the prom for the third time. Friends Izzy Bates and Hannah Bontrager, sporting sparkly necklaces and Hannah in a tiara, said they were most excited about “the bling,” in other words, selecting jewelry to match their dresses. Alex Kochte, in a red ball gown, and her date, Michael Young, in a white tux with a red tie and cumberbund, were perfectly matched. 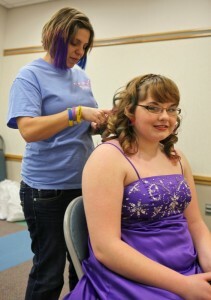 While the teens were emerging into the hall to pose for a paparazzari of parents, Tricia Degenhard and her team, Taylor’s Angels, began cleaning up their curling irons and make-up. All wearing matching blue t-shirts with the “Taylor’s Angels” logo, Tricia, a professional hairstylist and salon owner, and her friends have provided the “get ready for prom” service each year. It’s Tricia’s way of giving back since her 5-year-old daughter, Taylor, lost her battle with cancer more than 3 years ago. At 5:15 pm, the excited young men and women moved outside and into the limo with their assigned seats. They walked through a tunnel of more cameras and cell phones clicking away. When the limos arrived at the Ritz, a red carpet would await them. More flashes. More celebrity treatment. It was a night to celebrate … and be thankful.